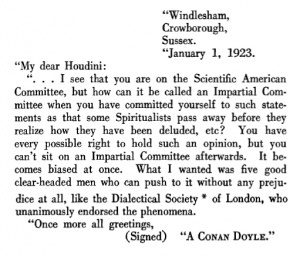 This letter was written by Arthur Conan Doyle to Houdini on 1 january 1923 from Windlesham, Crowhorough, Sussex. ... I see that you are on the Scientific American Committee, but how can it be called an Impartial Committee when you have committed yourself to such statements as that some Spiritualists pass away before they realize how they have been deluded, etc? You have every possible right to hold such an opinion, but you can't sit on an Impartial Committee afterwards. It becomes biased at once. What I wanted was five good clear-headed men who can push to it without any prejudice at all, like the Dialectical Society of London, who unanimously endorsed the phenomena. This page was last edited on 8 May 2017, at 16:23.